Great showing from newest CFFC club members, about 20 or so new club members turned out for the CFFC mentoring day at Wilson Creek...good crowd. Arrived at old mill site on Wilson Creek at 7:45 AM, just a little bit chilly early on with temps hovering around mid 30's, it warmed up perfectly to about the low 70's by noon time, clear blue sky, perfect weather. Our volunteer mentors each took out 2 to 4 new fly fishers for some on water briefing, instruction on how to rig up, casting & mending and some demonstration on how to catch those elusive trout. 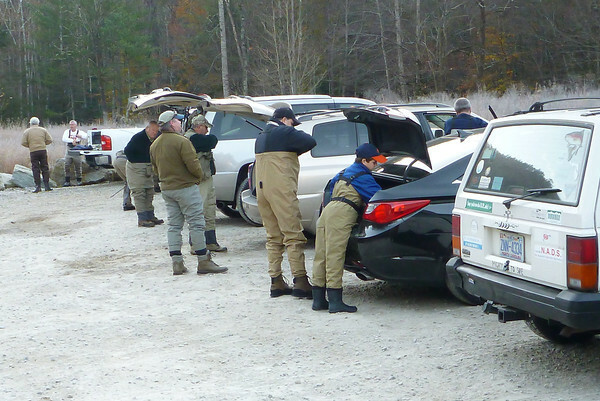 Seems from most reports everyone netted at least one or two fish over the course of the day. Mentor Ben Bishop had one of his fly fishers net a grand slam, Brook, Rainbow and a Brown! Great hot lunch was served up, piping hot chili to get everyone sweating before they headed back out on the river after lunch. 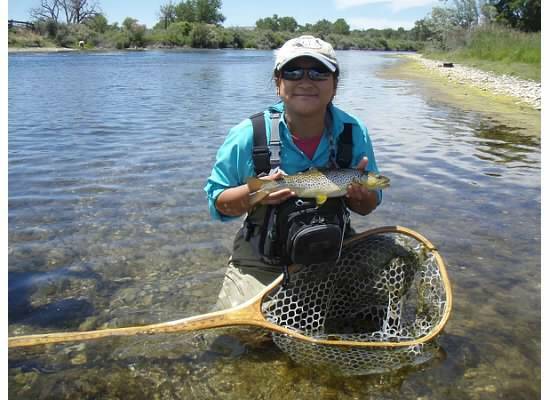 Huge thanks goes out to the mentors that helped out our newest fly fishers. THANK YOU, Ben Bishop, Ben Reinhold, Calvin Norton, David MacBurnie, Chris Roche, Jack Cummings and Eddie Williamson. 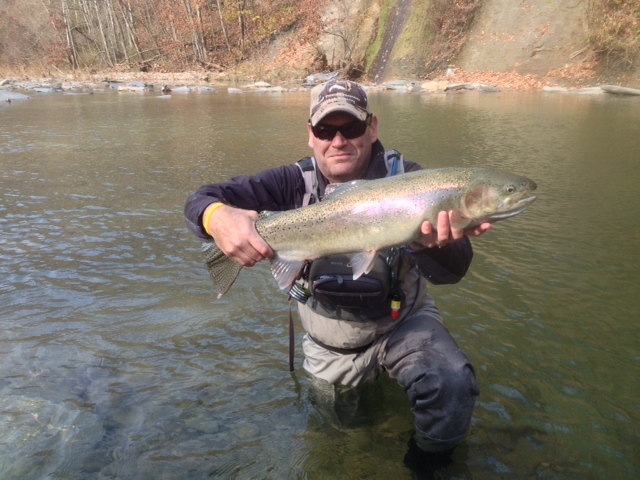 Three CFCC members made the trip this year to the Lake Erie tributaries to try their luck at landing a Steelhead. 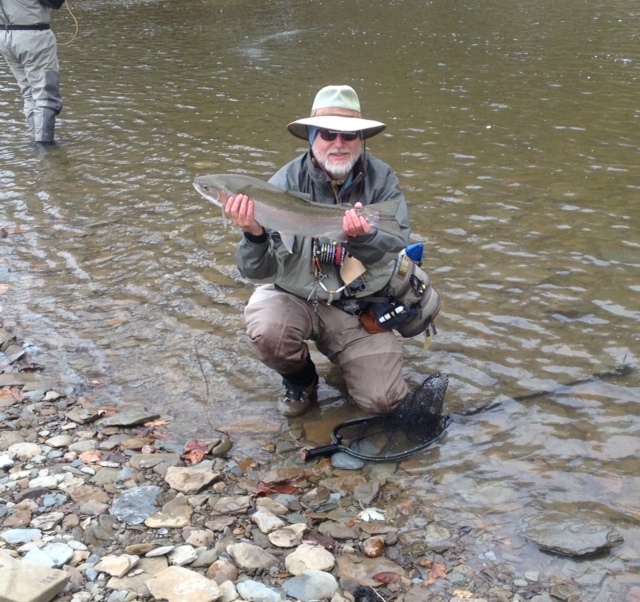 Dan Grose, Steve Patterson and Tim Jenkins made the trip to PA in early November to fish with Jeff Blood. 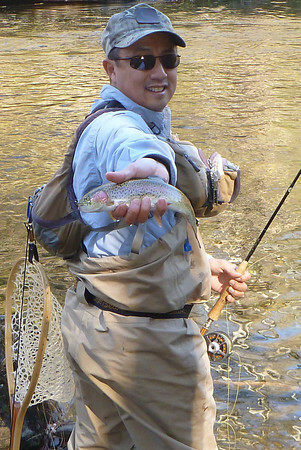 Based on Jeff's expert opinion and his vast network, the first guided day was spent fishing the Ashtebula and the Conneaut in Ohio. As the fish were not as plentiful and the fishing was shoulder to shoulder that first day, the guys were redirected on day 2 to fish private water on the Elk in PA with Eric Peterson. The crew stayed at the Sunset Motel in West Springfield, PA. They had good accomodations that were centrally located and at a great price. Something to keep in mind if anyone else is making the trip in 2013. Dan headed up a day early and took a stab at Walnut Creek, but had no luck his first day on his own. The first day guided started with Jeff meeting the crew at the hotel at 5:00 a.m. - this is definately a fishing trip and not a relaxation trip. Jeff took the guys to fish the Ashtebula in the morning as the locals were landing quite a few hogs earlier in the week. Jeff guided the fishermen to some private land, but other than one hook-up by Dan there wasn't much going on that morning. According to Jeff, the "Ash" had dropped a couple of feet in the last 2 days, and it was evident as the fish were hard to come by. 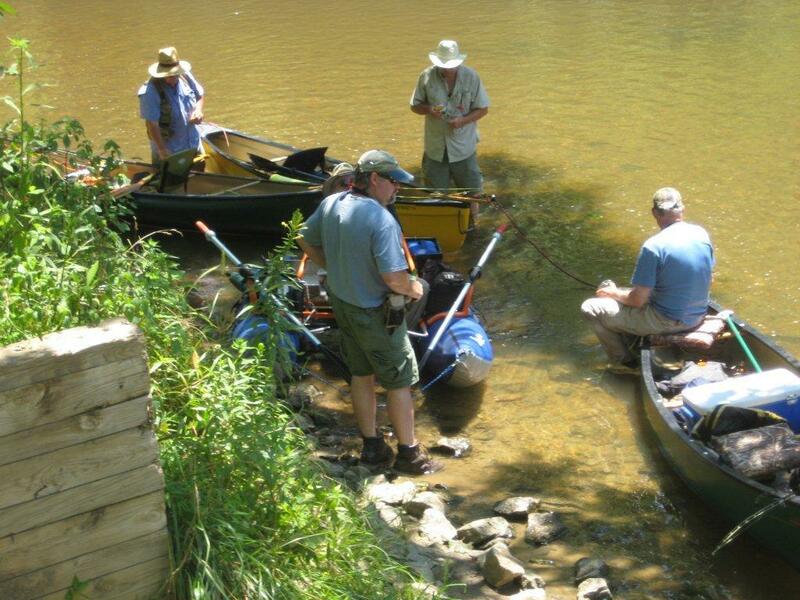 Jeff made the call by mid-morning to change the gamelpan and fish the Conneaut, also in Ohio. The guys hit the Conneaut which was much more crowded, but there were definately fish in those waters. Dan's time spent on his own a day earlier must have paid off as he was the only one to land a fish that day on the Conneaut. Dan landed the only 2 fish of the day. Jeff is a great guide, and wants everyone to catch fish. Because of angler error, there were quite a few break offs on that first day. Those who have fished with Jeff understand he is a sun-up to sun down kind of fisherman as he spent time with Tim until sundown trying to land a fish that day. At Jeff's guidance, Tim hooked into 3 fish in the last half hour of sunlight, but all 3 broke off. Jeff knew of a fellow guide who was open the second day who had access to private land along the Elk in PA to fish so he hooked the CFFC guys up to ensure they got into more fish day 2. Day two the boys were guided by Eric Peterson on Elk Creek in PA. This water was on private land, so the crew had much of the water to themselves. The boys met up with Eric and wre on the water by 7:30. Steve Patterson was the first to hook-up and land a fish within the first 30 minutes on the water. The fish were plentiful and the guide knowledgeable. All 3 fishermen landed Steelhead in that first hour, which was a sign of things to come that day. The fella's just missed a black bear run-in at the upstream pool. The remnents were riverside bear tracks and the smell he left behind. Dan was the first to land a fish in that pool and handed the run off to Tim. That pool was worth the trip as Tim's biggest fish of the day was landed after Dan first got the little guy (5 lb'er) out of the way. Eric treated the crew to a lunch back at the farmhouse of BLT's and his homemade Pepper Mustard which was a huge hit. All three guys caugh fish that afternoon as well. At the end of day two 12+ Steely's were landed on the Elk, which proved to be a banner day of fishing! Again, we would like to thank both Jeff Blood and Eric Peterson who prove to be incredible guides. 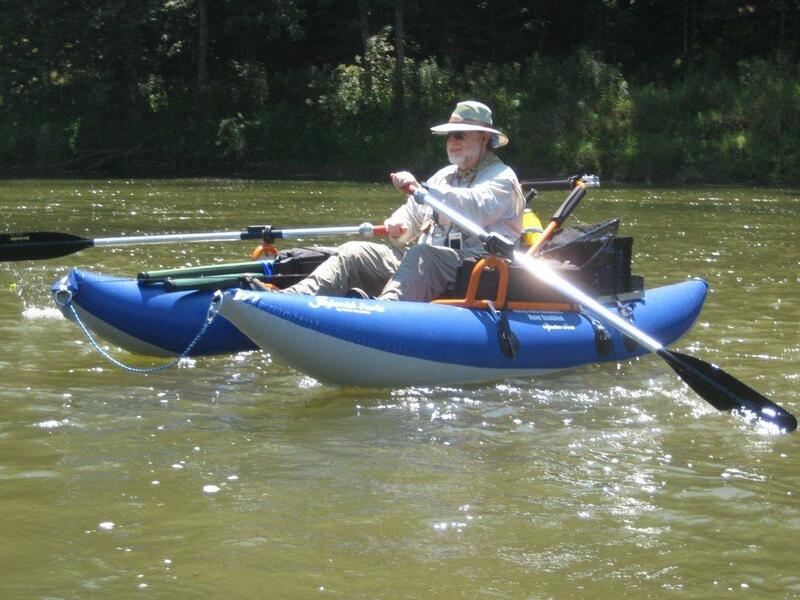 Keep your eye's peeled for a new multi-purpose net/wading staff to roll out in 2013 from Jeff Blood's team. Jeff gave the guys on the trip a sneak preview and the product looks like a winner. Steve, Dan & Tim's big adventure......Hammertime!!! 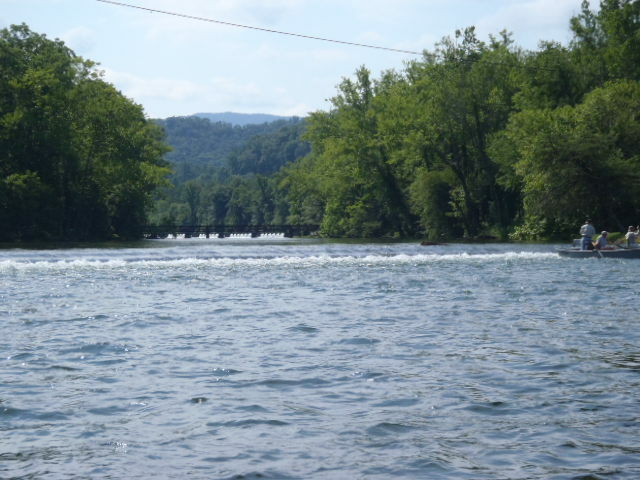 "The Hammer", "Paladin" & "Nightcrawler"
Several CFFC club members enjoyed a gorgeous July Summer Sunday morning floating a 6 to 7 mile stretch of the New River near Crumpler, North Carolina. The weather was perfect, sunny, high 70's to mid 80's, water was clear enough with a tinge of color to help make it near perfect fishing conditions. The water clarity was a perfect 3' to 4' visibility. 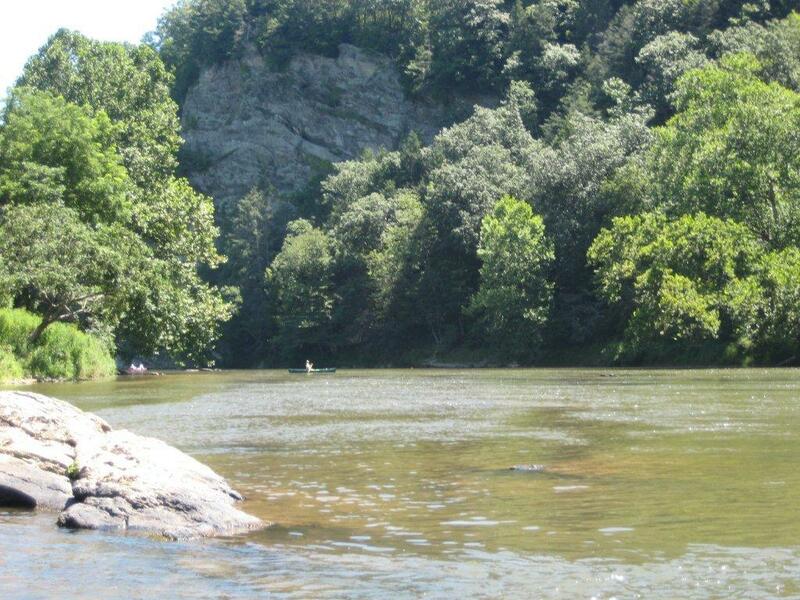 The put-in at the confluence of the North Fork of the New River lead us on a scenic float down stream past New River SP, and Zaloo's Outpost. Part of the group stopped for a quick riverside lunch at the canoe in only site at the state park then continued on to cross the Virginia state line to the VA Rt. 93 take out. Fishing picked up significantly after lunchtime. 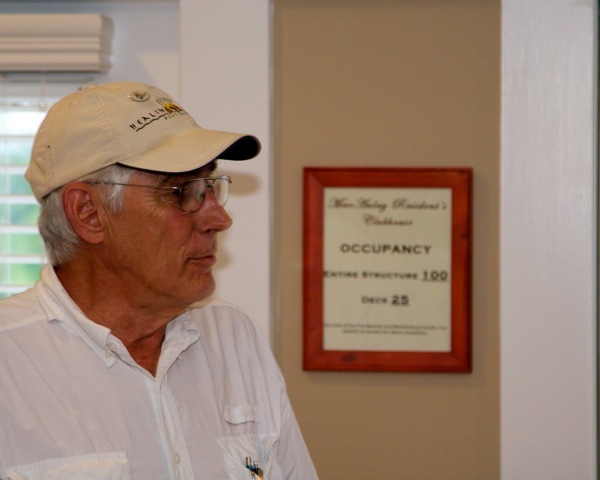 Special thank you to Richard "New River Man" Griggs for helping us work out the logistics of the float trip. 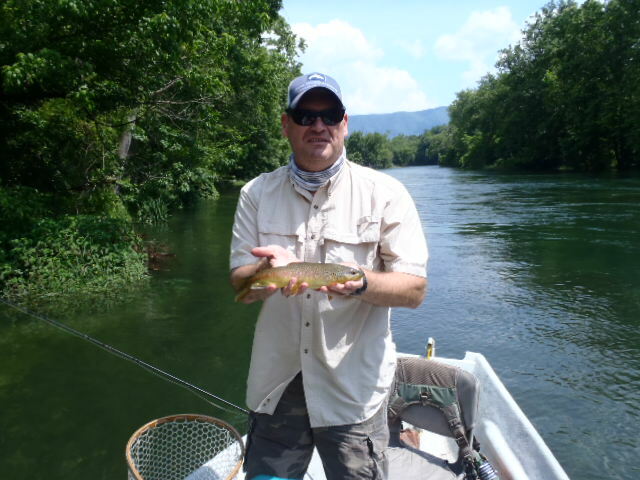 Richard guides on the New River, so if you ever want to float the New River contact Richard Griggs at Carolina Mtn. Sports in Statesville NC. Thank you Richard!!!!! We were all very glad to see Jack Cummings getting back up to par and making the float. Good to see Jack back on the water where he belongs. 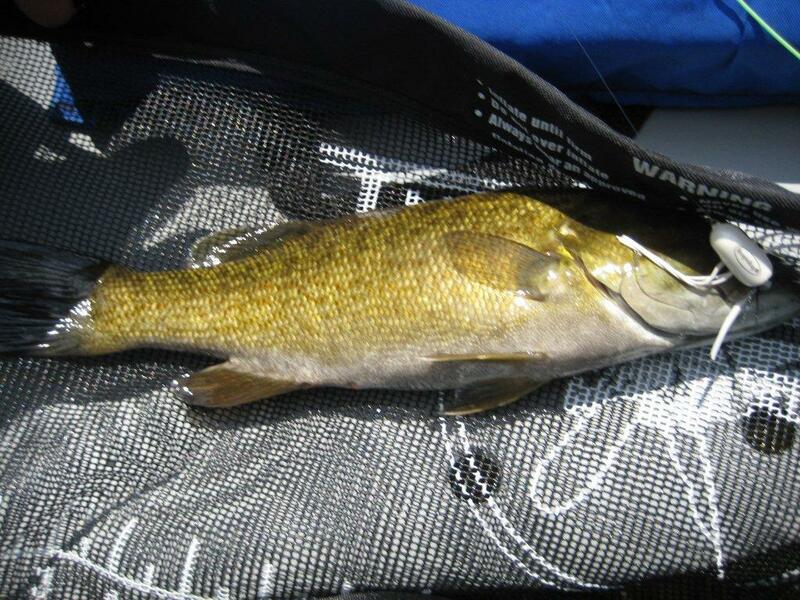 Members Richard Griggs, Carl Smith, Cam Binnie, Ben Bishop, Chris Roche, Dan Grose, Dave MacBurnie, Jim Fletemier all reported each catching several nice Smallmouth Bass, Redeye's, Green Sunfish throughout the day. 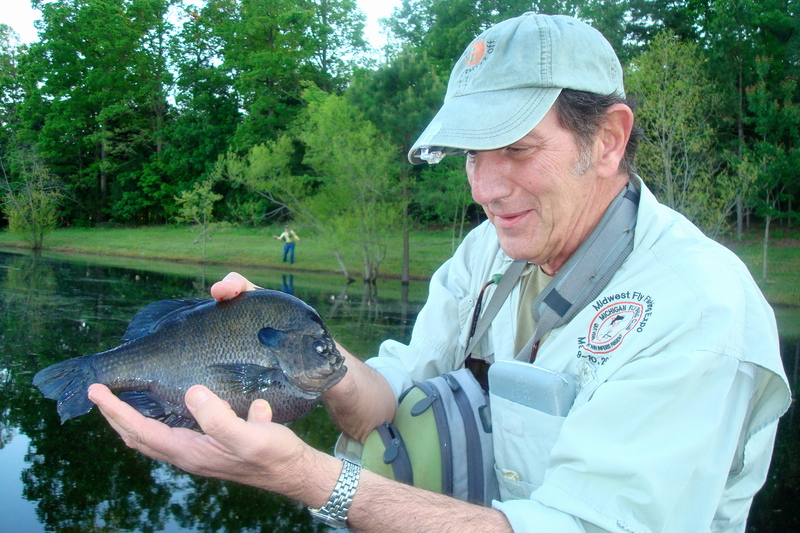 Fish were caught on surface with Boogle Bugs, Sneaky Pete's, and a variety of colorful poppers of all sizes. Quite a few fish were taken sub-surface and on the bottom with conehead rubber leg Wooly Buggers and Crawfish imitations. Thanks to Dan Grose, a well timed bladder failure helped keep water temperatures warm which made wading a pleasure....thanks Dan! Special thank you goes out to our shuttle service, Terry at Riverside Canoe Rentals, Thank you Terry! 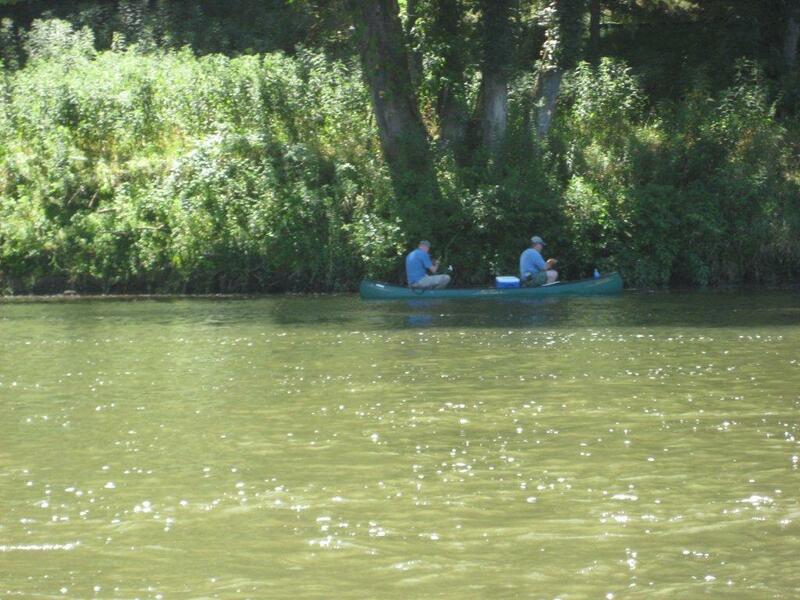 Terry rents canoes and kayaks at a very reasonable rate and offers a great shuttle service. Be sure to stop by and say hello to Terry. Going to Montana this summer was truly an experience of a lifetime. I didn’t know what to expect, but when I got there, it was mind-blowing. I have never seen such a beautiful place and fishing for four days straight was heaven. Fishing here in NC is so different from fishing the Big Horn River. I have learned so many new things during this trip. I’ve learned to tie flies better, and also cast A LOT better. Fly fishing is a challenge, but it was not fishing we did on this trip, but catching. The weather was great, fish were plentiful, and with beautiful scenery, I couldn’t have asked for more. Every day we fished with different guides, and I couldn’t be more thankful that I was chosen to be on this trip. It was a fishing paradise for me. 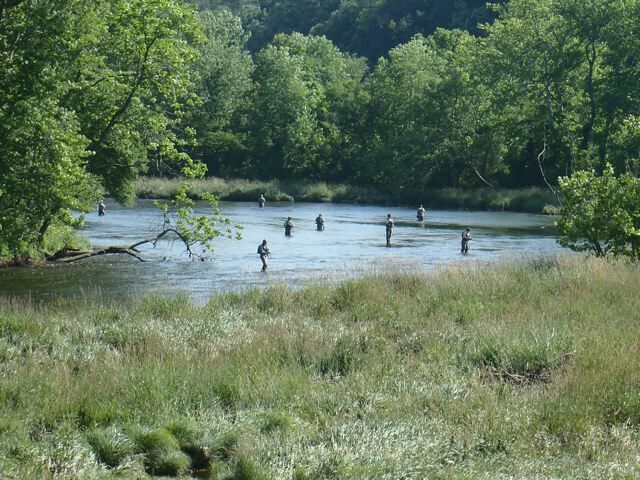 I can tell you all about it, but this is a trip you must experience with your own eyes and of course with your fly rod. My most memorable moments on this trip would most likely be catching the biggest trout I’ve ever caught. 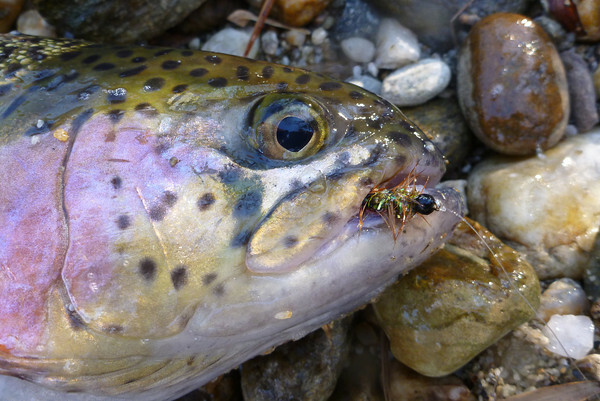 I hooked a 18.5” rainbow with a PMD and Zebra Midge as a dropper, actually, I caught two about that size. Out there in the west, they would consider this to be average size, but for me, it was exhilarating. The fish was as long as my arm! How can that not be a biggin? Last, but not least, I enjoyed meeting teenagers my age who also fly-fish. It was a little challenging at first, but all that mattered at the end of the day, was if you hooked him or not. I would like to thank everyone who made this fishing paradise possible for me. I will never forget this trip. I learned, I fished, I became independent. I also earned a few nick names here and there with my horrible casting, but that’s why I was sent out there, to better myself and be exposed to western fishing. This once in a lifetime experience really did open my eyes and I will keep on pursuing this sport and also to just have fun. CFFC club members, Gary Jones, James Smith, Carl Smith, Calvin Norton, Tim Jenkins, Ben Bishop, Rick Meeks, Tony Aldridge, Dave MacBurnie all enjoyed a long & well earned Father's Day weekend on the South Holston River in Bluff City TN. 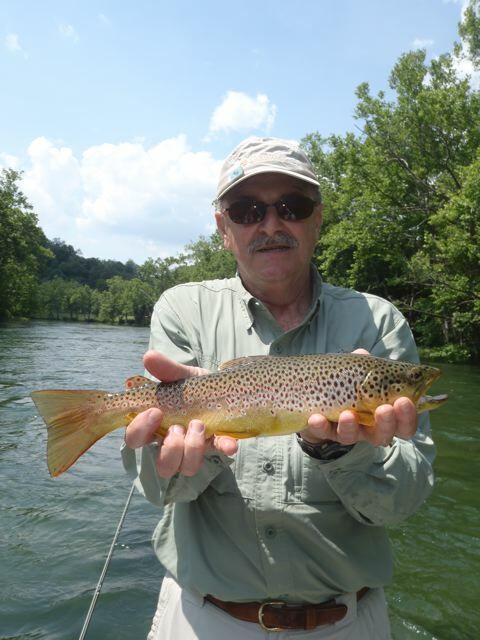 Tim Jenkins & Rick Meeks enjoyed a nice float trip with Randy Ratliff and boated some nice looking Browns & Rainbows. Reports are in that the river fished pretty well while wading, sulphurs, stripper midges & soft hackles got it done....but it was a little crowded, a few favorite spots required you to bring your own rock to stand on. Tim Jenkins nice Brownie Rick Meeks nice butter Brown ???? Steelheading in June???? Steve Patterson strikes again!!! 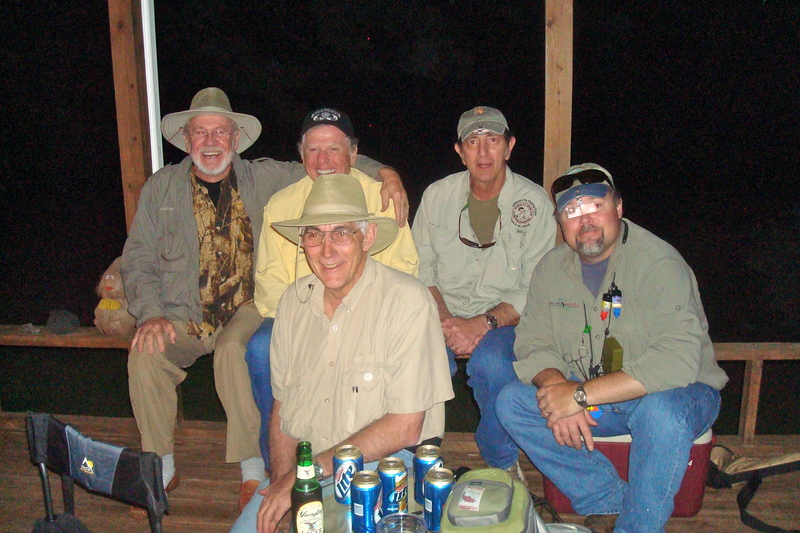 CFFC club members Tim Jenkins, Chris Roche and Steve Patterson hosted a few active duty wounded Marines and 1 retired wounded Marine at the Mitchell River Farm for a weekend full of fly fishing, food and great camaraderie. Matt Fish from ECU Biofeedback Lab escorted active duty wounded Marines Andy Gerhert, Randy Rehling, Jason Browning and SSgt.(Ret.) 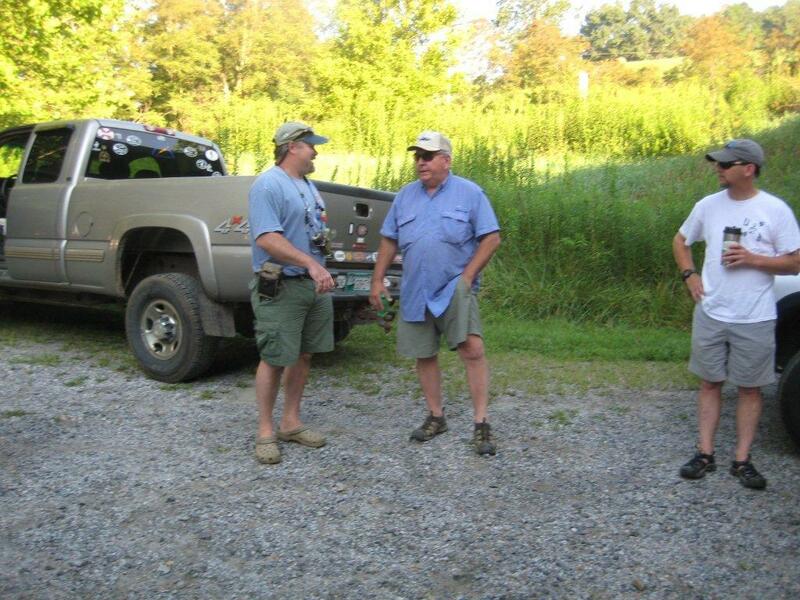 Armand Mayville up to Dobson NC for a long fly fishing weekend. All the Marines were guided by volunteer guides from the Charlotte area, all CFFC & TU members. The weather was perfect, mid 70's all weekend. The Mitchell river fished fantastic, the Marines all caught a bunch of big dumb stockers and Randy's first day was a 30 fish day capped off with a 17" Brown. Andy & Jason burned up the private pond pulling out dozens of 15" Rainbow Trout. Armand lit it up all weekend and took the grand prize for his biggest fish of the day(see photo)...a 4" creek chub! Kidding! The weekend was ended on a high note on some private trophy water on Sunday. Thank you needs to go out to Tim Slape from Orvis Outfitters in South Park, Rocky River TU members Casey Brock and Tim Ramsey who all selflessly stepped up at a moments notice to help guide our wounded warrior guests. 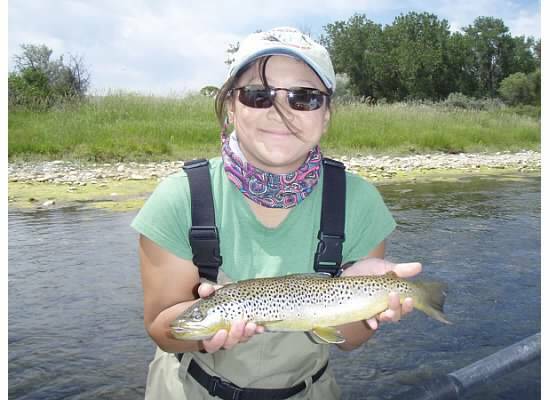 Jesse Browns Outdoor's Charlotte that graciously lent us badly needed fly fishing gear. To all THANK YOU! Special thanks to Carl "Trout Whisperer" Freeman (www.mountainstocoast.com)and Terry & Renae Troy who hosted us on their private water for some trophy trout action on Sunday....nothing but big smiles from the wounded Marines. Great guests, great location, great weather, great fishing....great weekend. Thank you wounded warriors for your service, we're all grateful, enjoy the rest of your years in peace. 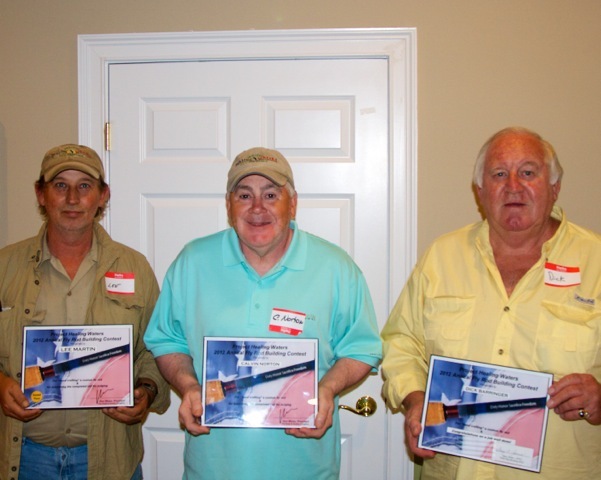 Congratulations to Project Healing Waters Member & Gulf War Veteran Lee Martin. 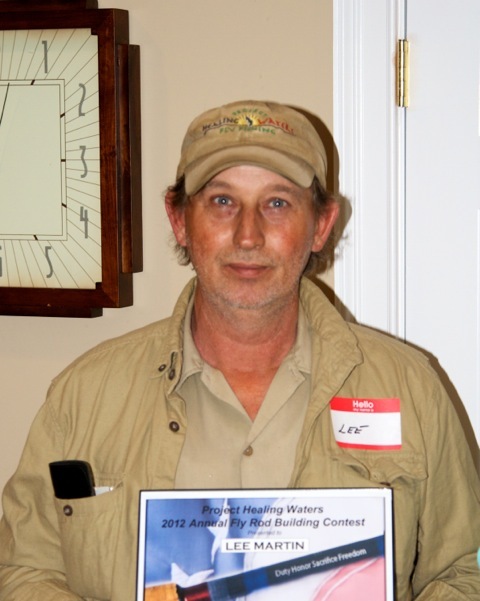 Lee placed 2nd place Nationally in the PHW 2012 Rod Building Contest. 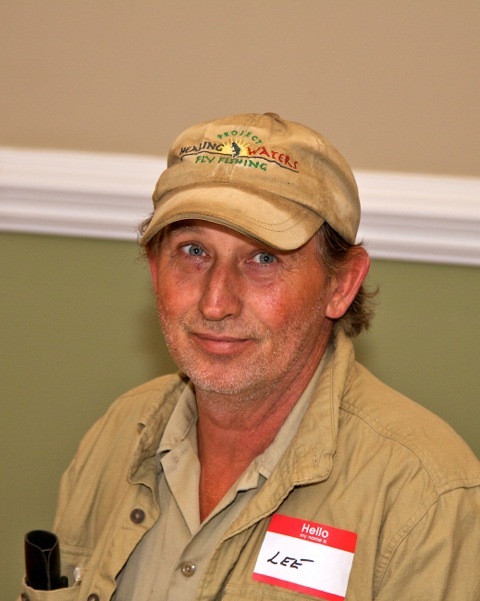 Lee was provided expert guidance & rod building instruction by CFFC President & rod builder Gary Jones, way to go Gary! Lee Martins 2nd Place Prize is an all expense paid guided fly fishing trip to Colorado. Special thank you to Marvin Cash, Charlotte PHW Director for helping organize the Charlotte groups participation in the PHW National Contest, outstanding job by Marvin Cash!!! Congrats Lee, you earned it and deserve it! A couple CFFC OCFFD patients made an emergency therapy trip to visit their Doctor at Loch Geezer in never-never land(aka. Monroe, NC). Dr. Fulton served up just the cure for those of us suffering from the debilitating affects of OCFFD(Obsessive Compulsive Fly Fishing Disorder).....Ice cold beer....grilled burgers....big ole ugly-line tuggin'-drag rippin'-hand stinkin'- Bluegill and Largemouth Bass. Dr. Fulton helped us all cope with the tell tale signs of the dreaded affliction; involuntary hand twitching, confused speech, inability to concentrate, sleeplessness and sudden sleep awakening to loud outbursts of "I got one on, I got one on" all associated with OCFFD. Thanks Doc for the treatment, your magic worked wonders I think we're all gonna be OK for another week or so. Peddler is now cured thanks to a timely intervention, thanks Doc! Bearspray & Nightcrawler helped guide a couple of CFFC club member Project Healing Water Vets for a little day trip to Blowing Rock North Carolina. 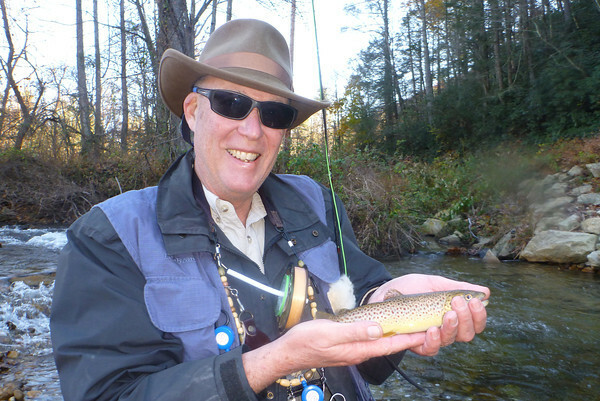 A short little drive up to Blowing Rock, NC and our friend Carl "Trout Whisperer" Freeman can put you on the biggest trophy trout in the North Carolina Mountains, bar none...not 1 or 2 trophy size trout in a day. Carls place is Cherokee on steroids! 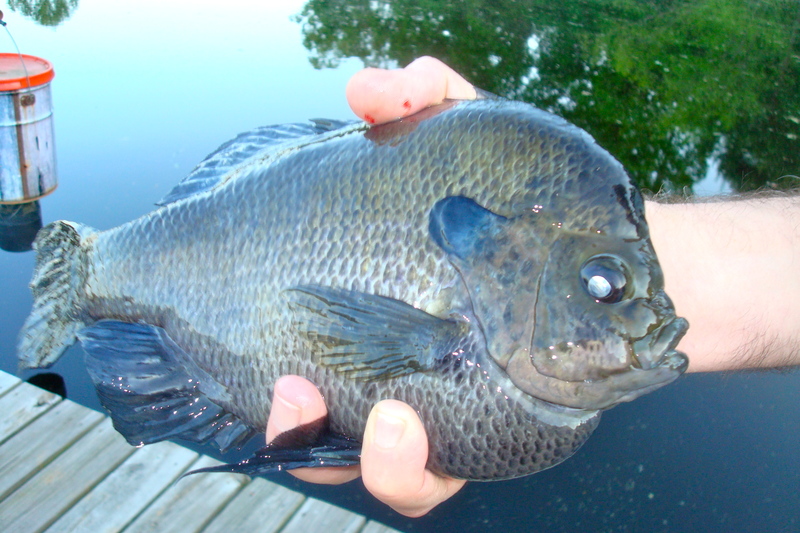 Carl will net you dozens of these monster pig fish one after another after another. The 5 & 6 wt. 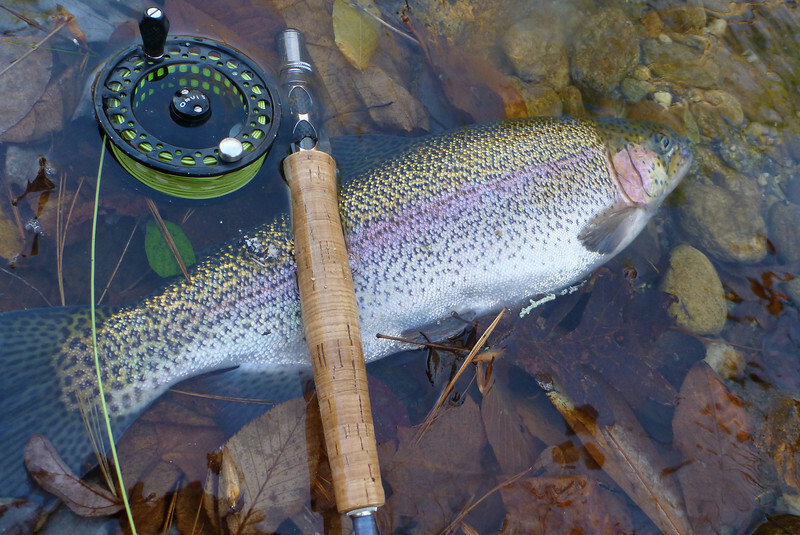 fly rod will be bent all day long and your arms will be sore at the end of the day. A day with Carl will leave you scatchin yer head asking for some BenGay for the arm....when we gonna do this again? Both Calvin "Big Trout" Norton & James "Turbo" Smith probably netted 20-30 fish that averaged maybe 3-5lbs each, a couple 8-9lbs fish too. We actually kinda lost count to be honest???? What the heck, photos speak louder than words, take a look for yourself...cuz I ain't lyin. LEE BUILT A 10 WT. SWITCH ROD & WON SECOND PLACE AND A COLORADO FLY FISHING TRIP! WAY TO GO LEE AND WAY TO GO ROD BUILDING INSTRUCTOR GARY JONES!!!!! CONGRATS...YOU BOYS ARE AWESOME!!!! 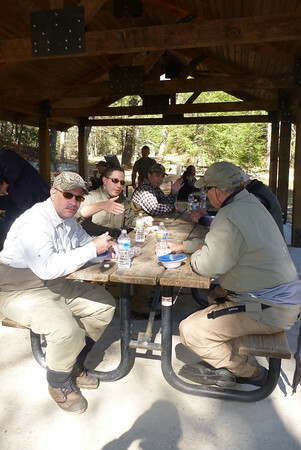 Project Healing Waters Veterans participate in the 2012 Rod Building Class and Competition. 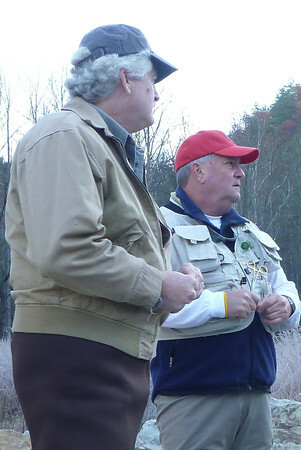 Expert instruction and guidance on rod building by CFFC club President Gary Jones. 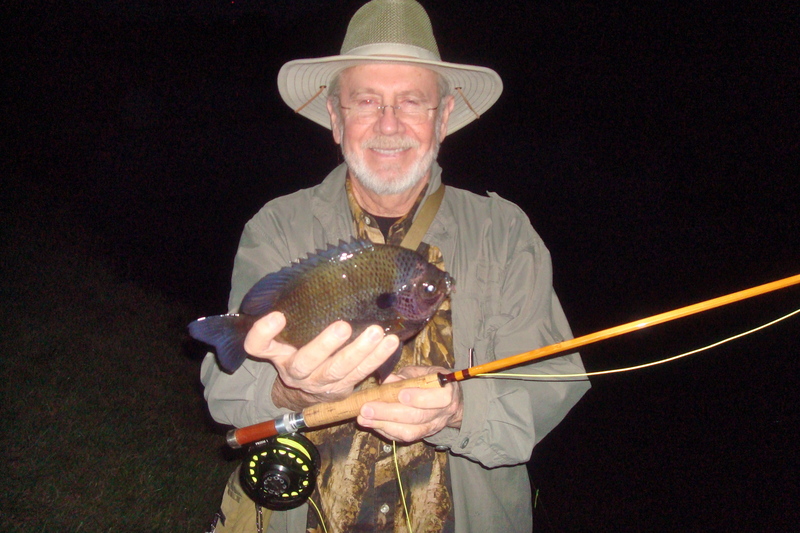 The winning rod builder wins a PHW sponsored trip to Chile, South America for some homemade fly rod bending action. Huge thanks to Gary Jones...and all his helpers! What a great club!